EvidenceCare puts patient-focused clinical decision support in the hands of emergency physicians at the point-of-care, when you need it most. Designed by an ER physician and curated by the names you know like Jeff Kline, Amal Mattu and Peter DeBlieux, EvidenceCare works the way you work. While EvidenceCare is FREE to providers, Professional Plus subscribers can earn CME credits accredited by ACEP just for using the tool. Actionable recommendations, designed by your peers. 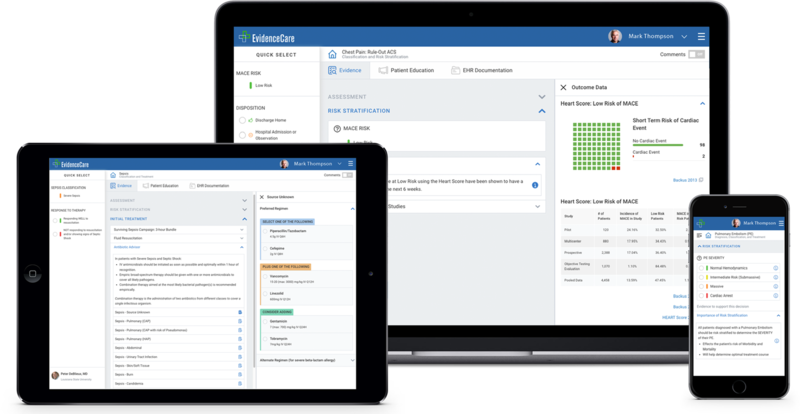 EvidenceCare complements your work flow by presenting credible evidence, resources, and tools precisely when you need them—specific to each patient. Involve patients and families in the decision-making process by sharing easy-to-read, easy-to-digest educational materials. Help patients feel empowered to actively engage in their care plans, leading to positive outcomes and greater overall patient satisfaction. Designed by an ER physician, the most current and relevant medical content is delivered quickly in a format that is easily consumable at the bedside. Professional Plus subscribers earn CME credits, accredited by ACEP, for their time using EvidenceCare's best-practice protocols and have access to a feature that can accelerate appropriate clinical documentation into any EHR. Put Decision Support In Your Hands Today! For more information, visit EvidenceCare at www.evidence.care. An innovative member benefit brought to you by ACEP.